Minor Pylant was born on February 28, 1929, in Mississippi. He enlisted in the U.S. Army on September 10, 1948, and served as a scout, infantryman, and intelligence specialist before completing Special Forces Training in 1959. SFC Pylant served as a Light Weapons Leader with Company A, 8th Special Forces Group at Fort Gulick, Panama Canal Zone, from April to December 1963, and then as Operations Sergeant with Company B, 8th Special Forces Group in Panama from December 1963 to July 1966. His next assignment was as Operations and Intelligence Sergeant with Company E, 7th Special Forces Group at Fort Bragg, North Carolina, from August to October 1966, followed by service as Operations and Intelligence Sergeant with Company B, 5th Special Forces Group in South Vietnam from October 1966 to October 1967. He served as Operations and Intelligence Sergeant with Company E, 7th Special Forces Group at Fort Bragg from October 1967 to April 1968, and then as Operations and Intelligence Sergeant and Reconnaissance Team Leader with the Studies and Observation Group in South Vietnam from April 1968 to April 1969. SGM Pylant served as Operations Sergeant with Company A, 6th Special Forces Group at Fort Bragg from April 1969 to January 1971, and during this time he served with the Support Detachment in Florida for the Son Tay Raid, a clandestine mission to rescue American Prisoners of War in North Vietnam on November 21, 1970. His next assignment was as Sergeant Major for Company B, 6th Special Forces Group at Fort Bragg from January to March 1971, followed by service as Sergeant Major for Company B, 5th Special Forces Group at Fort Bragg from March 1971 to April 1972. He served as Sergeant Major of Company C, 2nd Battalion of the 5th Special Forces Group at Fort Bragg from April to June 1972, and then as Battalion Sergeant Major for 2nd Battalion, 5th Special Forces Group from June 1972 until his retirement from the Army on November 1, 1974. Minor Pylant died on January 18, 2009. Sergeant Major Minor B. Pylant distinguished himself by exceptional courage while Sergeant Major of Headquarters & Headquarters Detachment, 2nd Battalion, 5th Special Forces Group (Airborne), 1st Special Forces, Fort Bragg, North Carolina on 24 June 1973. On 24 June 1973, Sergeant Major Pylant discovered three people clinging to an overturned boat in the flood swollen Cape Fear River. Sergeant Major Pylant immediately directed a young boy to alert the police, then drove quickly along Highway 87 to a point farther downstream. Leaving his car, he sprinted 300 yards to the water's edge and waited. Minutes later the boat came into sight moving fast in midstream. A man, woman, and a young girl were struggling desperately to hold on to the boat. With complete disregard for his own safety, Sergeant Major Pylant dove into the swirling water and swam one hundred yards to the overturned boat. When questioned, the man told him that his wife and daughter were non-swimmers and that he was a very weak swimmer. Sergeant Major Pylant quickly re-positioned the family on top of the boat. By talking steadily in a calm, strong voice and remaining self-confident, he soon reassured the trio. The water was too fast and violent to swim the boat to shore, so Sergeant Major Pylant devoted his energy to keeping the craft stable and the family calm. For three-fourths of a mile, he rode with the daily until a rescue boat finally drew along side. Sergeant Major Pylant's prompt, decisive action in entering the turbulent Cape Fear River contributed directly to saving the lives of the three people. 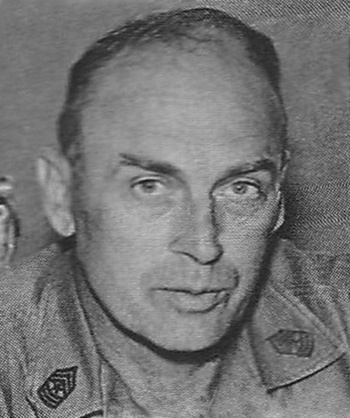 The heroic manner in which Sergeant Major Pylant risked his life reflects great credit upon himself, the 5th Special Forces Group, and the United States Army.